President Donald Trump is calling for members of both parties in Congress to support his ideas to replace the Affordable Care Act. In a speech before Congress Tuesday night, Trump outlined, for the first time, a more detailed healthcare reform package. First, he wants people with pre-existing conditions to maintain coverage. Trump suggested Americans buy their own plans with tax credits and expanded health savings accounts. It's unlikely Democrats will back many of Trump's suggestions. 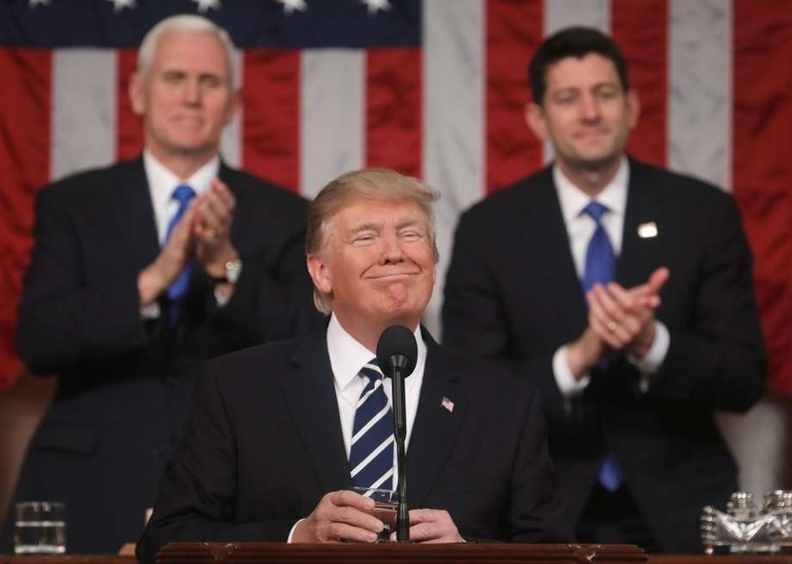 While Republicans stood and applauded during the evening address, their colleagues across the aisle largely remained seated and stone-faced. Trump pushed back against the need for stabilizing the individual market before addressing Medicaid expansion. GOP plans appear to favor a Medicaid program that offers capped federal funding. On Tuesday, Trump seemed to indicate the two reforms should occur concurrently. Earlier this week, Trump met with insurers who said they were encouraged by the administration's recent moves to address some of the industry's concerns. In what appeared to be a nod to governors who also met with the president this week, Trump called on Congress to give states resources and flexibility to tweak Medicaid as governors see fit. Finally, he returned to his campaign idea of allowing insurance be sold across state lines. "Mandating every American to buy government-approved health insurance was never the right solution for America. The way to make health insurance available to everyone is to lower the cost of health insurance, and that is what we will do." His ideas reflect what other Republicans have included in plans circulated over the past year, though no one plan appears to have broad support. Policy experts have decried many of the ideas, such as a greater reliance on health savings accounts instead of premium subsidies. HSAs fail to benefit low-income people who might not have extra cash to store away for healthcare, according to the Center for American Progress. “This proposal would replace assistance for low-income people with a tax shelter for the wealthy,” the left-leaning think tank said. HSAs are generally tied to high-deductible health plans, meaning that individuals might be responsible for higher out-of-pocket costs. Some conservative lawmakers say tax credits and HSAs amount to "Obamacare lite." Former Kentucky Gov. Steve Beshear, who expanded Medicaid while in office, delivered the Democrats' response to the speech. Kentucky's drop in its uninsured rate was one of the largest in the nation because of the expansion. He voiced concerns that Trump's ideas would result in more uninsured people. "You and your Republican allies in Congress seem determined to rip affordable health insurance away from millions of Americans who most need it," Beshear said. Still, he said he hoped Trump could be successful in providing more and better healthcare. The American Academy of Family Physicians expressed dismay over Trump's ideas. "He has stepped back from policies that will ensure all Americans have access to meaningful, affordable healthcare coverage,” said Dr. John Megis, president of the trade organization.